Yamaha's new MT-01 will make more torque than a Hayabusa. Insiders say it will thump out 110ftlb of torque. A Hayabusa makes around 100ftlb while a GSX-R1000 makes a little over 80ftlb. And it's the big torque that's likely to make it a huge thrill to power out of corners. If the looks and the figures have got you intrested, you could win VIP test rides and a VIP entry to the Munich Show at which it will be launched. Click here to enter. This first official picture of the new MT-01 production bike also proves Yamaha has lost little of the flavour in turning it from a show-stopping concept to a road-going reality. 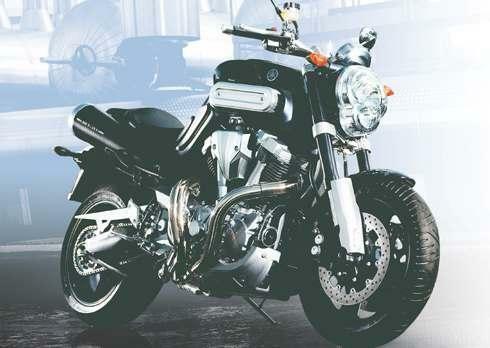 Its 1700cc V-twin motor and radical styling makes it the natural successor to the firm's V-Max. But the difference is that where the V-Max, which ended production in January this year, was fast, it was also evil-handling. The new bike puts the emphasis on enormous grunt rather than top speed but is also blessed with sports-spec chassis parts to make it go where you want it to. Its final version is very close to the MT-01 show bike first exhibited in 1999- except that the suspension is more conventional. It is likely to make around 100bhp and be priced to rival BMW's Rockster and Ducati's Monster S4R - at around £9000. It's due on sale in February next year. Read more about it in the July 14 issue of MCN. Click here for the MT-01's own site.